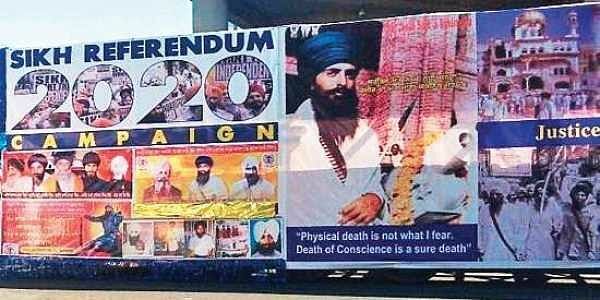 CHANDIGARH: The Punjab unit of Bharatiya Janata Party on Sunday asked the ruling Congress-led government to immediately take down the “Referendum 2020” banners calling for approval on Punjab’s ‘independence’ put up by the US-based Sikhs for Justice (SFJ) in various parts of the state. “The state government should not only remove the hoarding, but also take action against those who designed, printed and erected them, besides putting them on various buildings and places across the state,’’ BJP’s state leadership said. “We cannot allow such anti-national organisations to further Pakistan’s agenda on Indian soil. If you cannot act, we will act and remove all the hoarding,” the party said adding that it is a sinister attempt by anti-national forces to disturb the peace and harmony of Punjab. The party said although chief minister Amarinder Singh has been vocal against “Khalistani elements” and organisations like Sikhs for Justice, his own government has turned a blind eye towards the referendum hoarding. Leaders of the saffron party alleged that Pakistan, which is harbouring terrorists wanted by India is constantly at work to disintegrate the country by funding and supporting separatist organisations that create unrest in border states like Jammu & Kashmir and Punjab. “Sikh for Justice is one such organisation. The Sikhs for Justice campaign in the US and Canada, and activities in the state, including the putting up of hoarding, seems to be a part of the Pakistan’s premier intelligence agency — Inter-Services Intelligence’s (ISI) plan to create unrest in India, they added. During Prime Minister Narendra Modi’s recently concluded visit to the United States, Sikhs for Justice activists had held a rally in Washington DC calling on the US president to support their movement for an independent homeland.